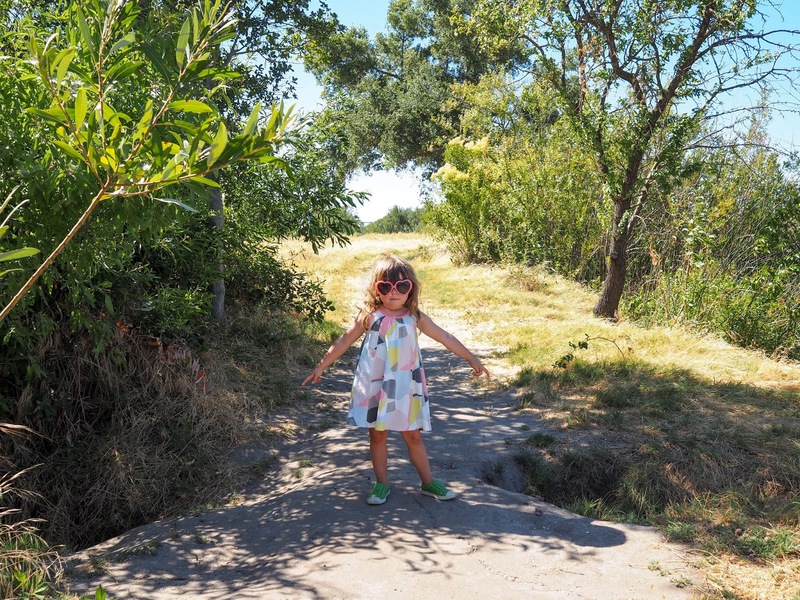 Recently we've been getting out and about exploring "new to us" Bay Area parks on weekends. 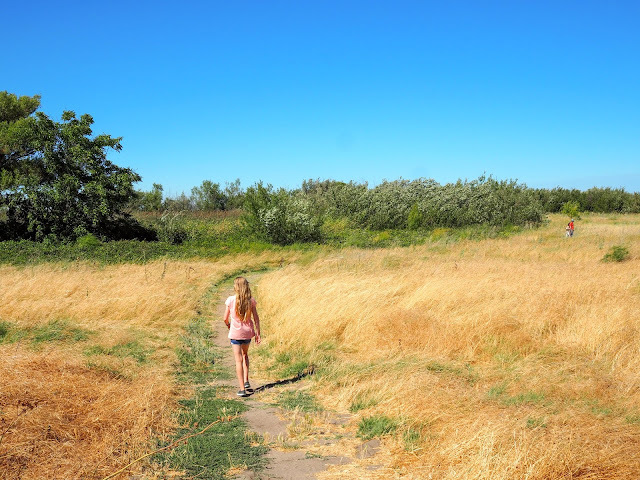 We're really lucky to have so many amazing and varied parks within such a short distance of our home. 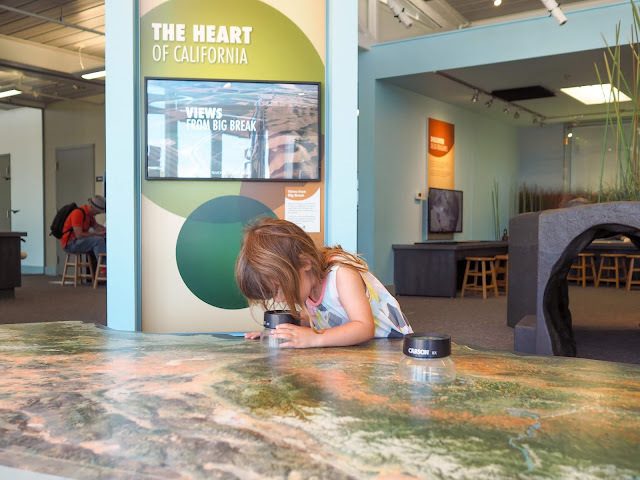 Beaches, rivers, mountains, cliffs, redwood forests... there's a little bit of everything. 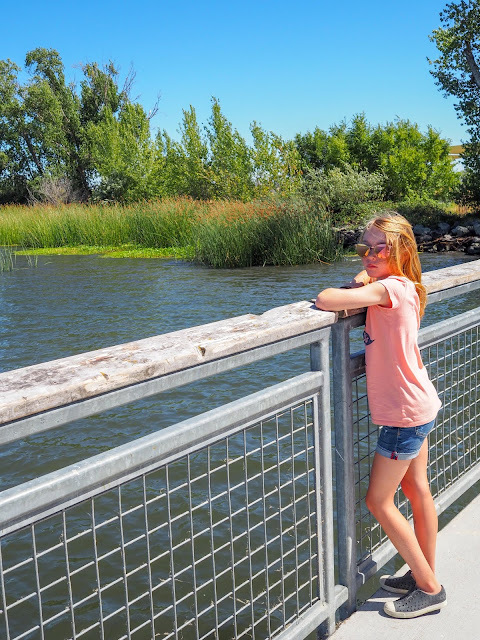 With so much shoreline along the San Francisco Bay and its tributaries, there is no shortage of picturesque water front parks to visit. What could be better than visiting a waterfront park on a Summer's day? 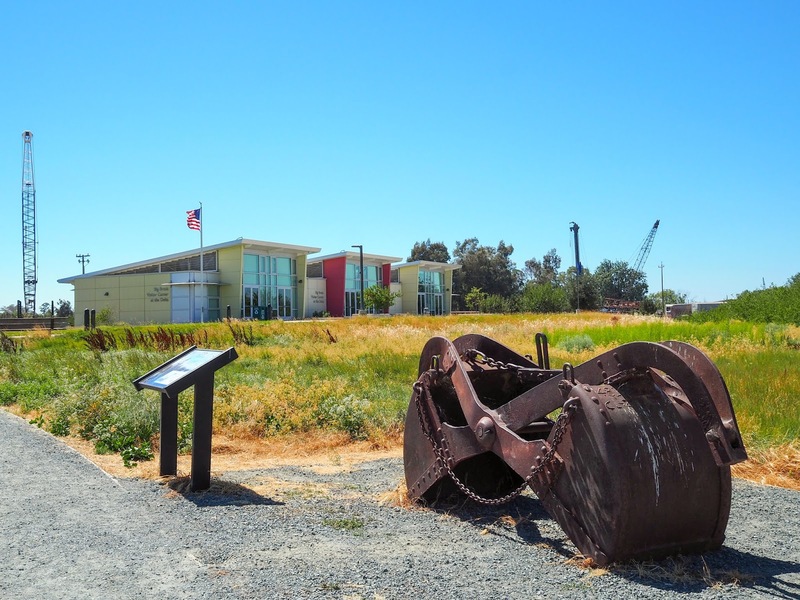 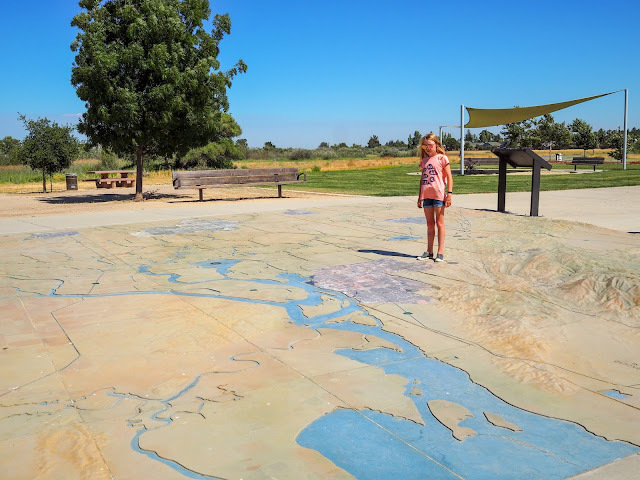 This past weekend we visited Big Break Regional Shoreline in Oakley. 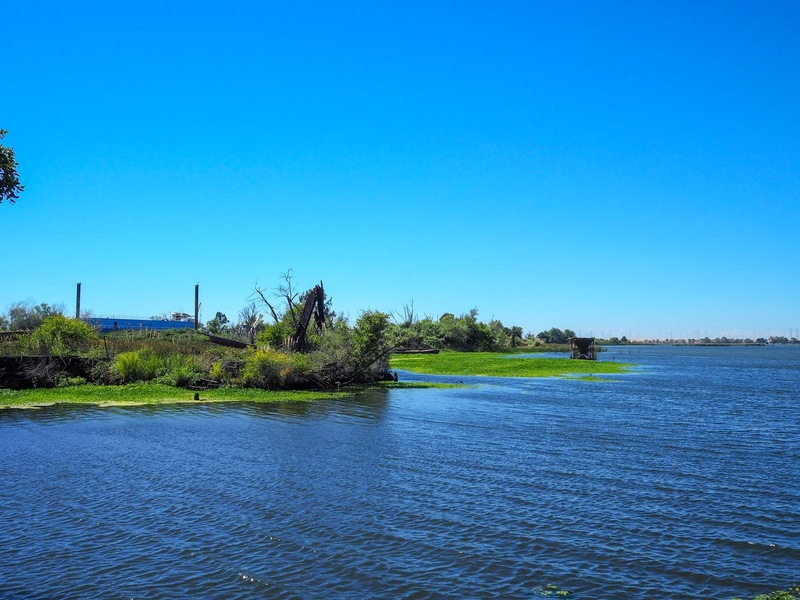 Big Break is located in the California Delta, a 1,150 square mile area where fresh water from the Sacramento and San Joaquin Rivers meets saltwater from the ocean. 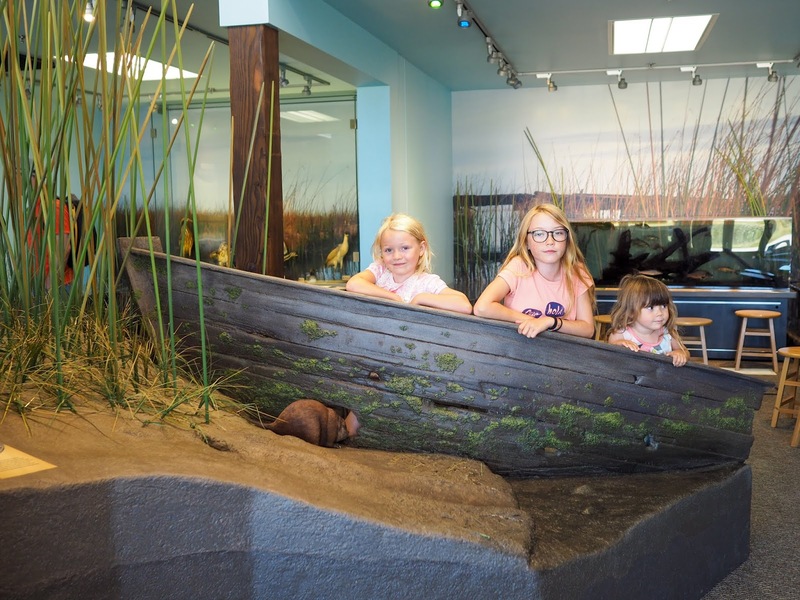 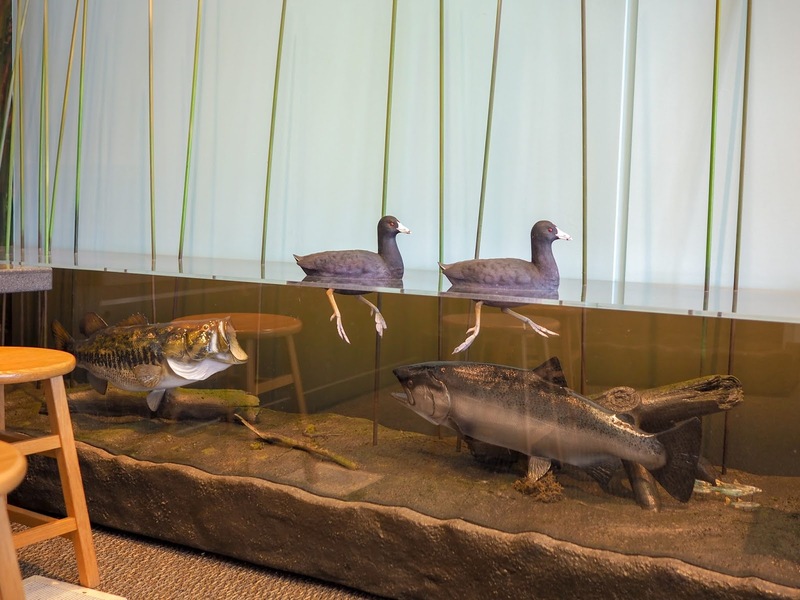 The Delta is the largest estuary on the west coast and is home to a large variety of fish, birds and mammals including beavers, river otters, muskrats and mink. 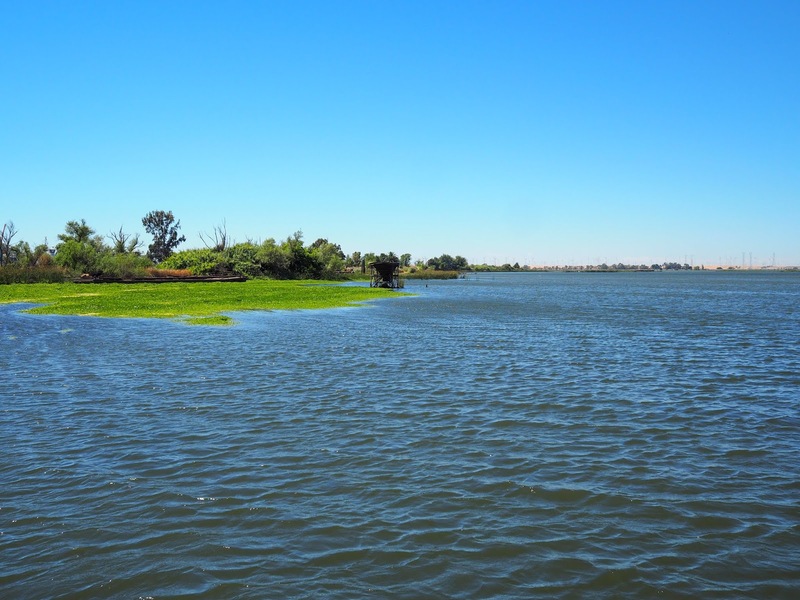 It's also home to cool Delta breezes which were much appreciated on this hot day! Despite the size of the Delta, the shoreline park is relatively small and makes for a great afternoon destination. 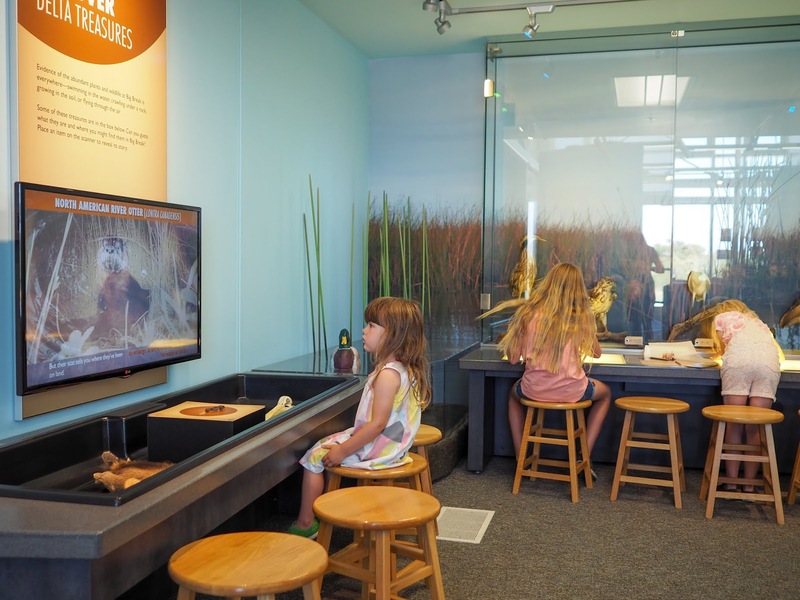 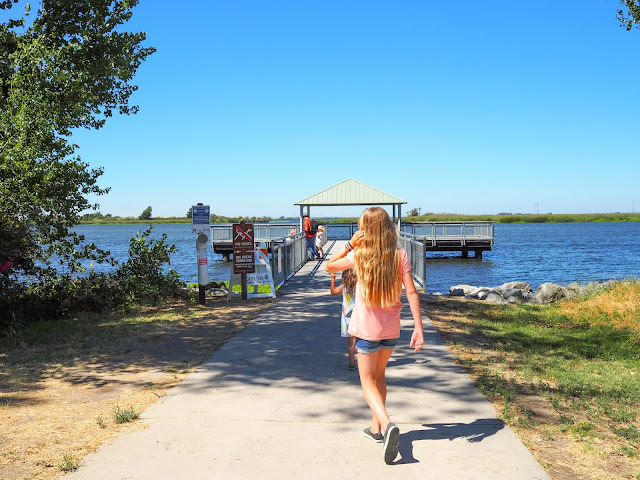 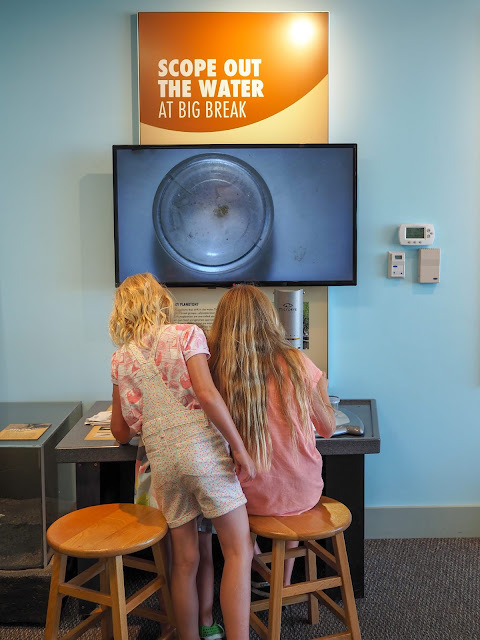 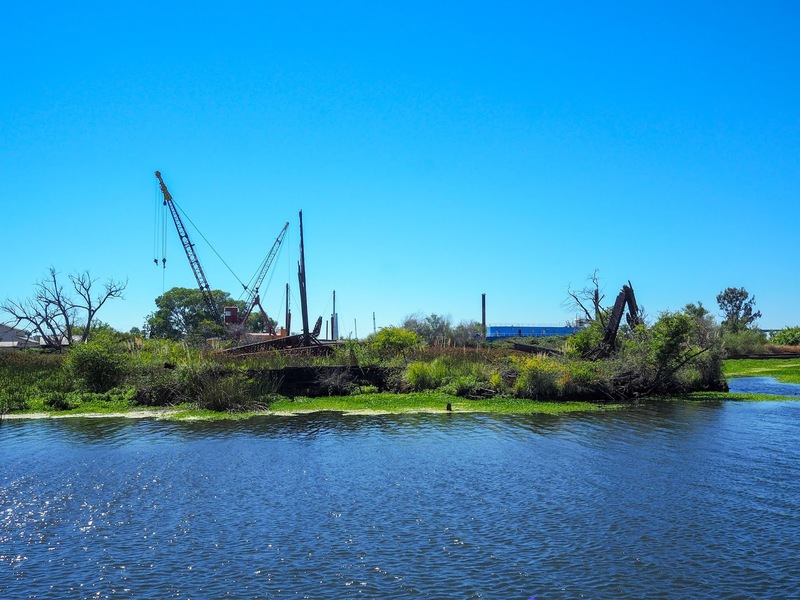 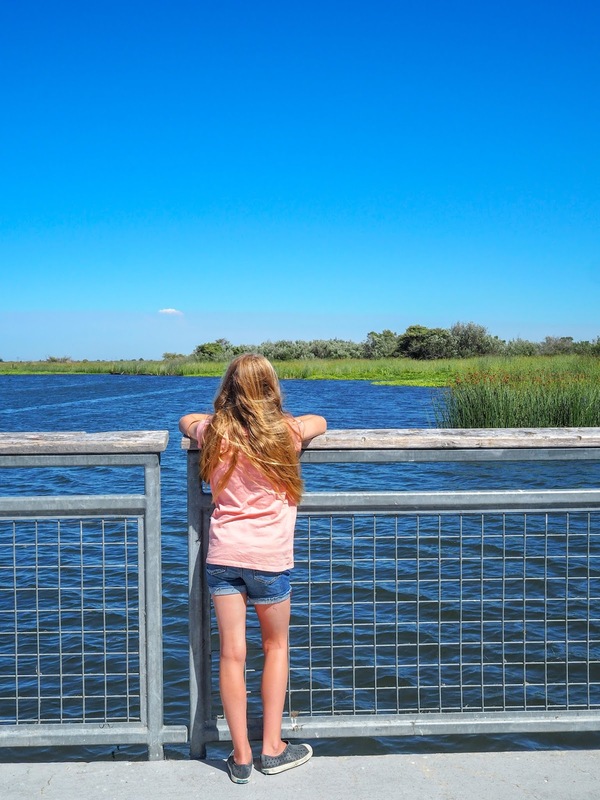 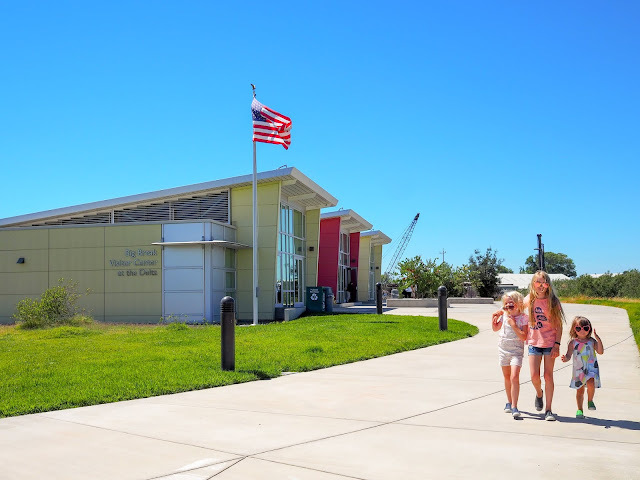 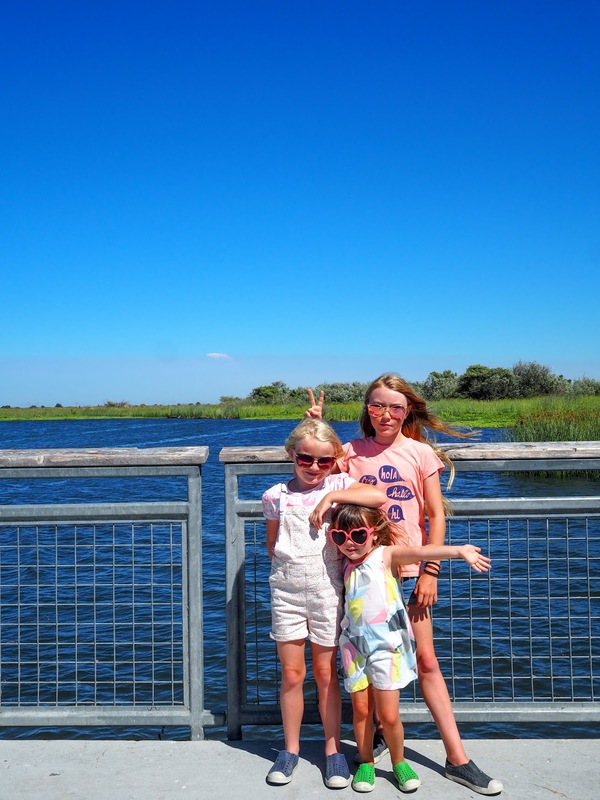 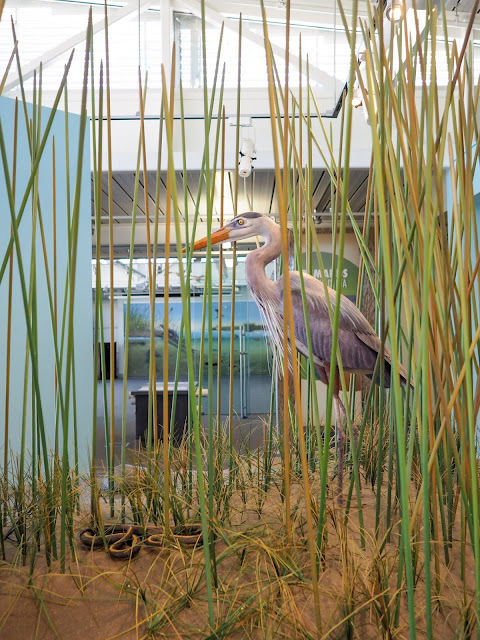 There is an informative visitor center filled with interactive displays, picnic areas, an amphitheater, a kayak launch, a shaded sand play area, a small hiking trail and an observation pier perfect for fishing or taking in the views. 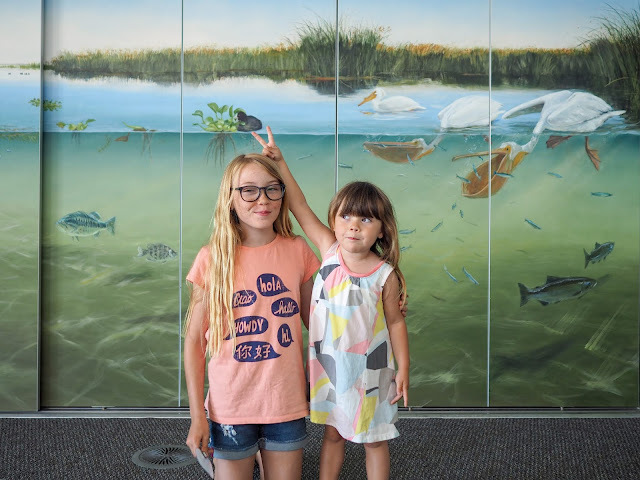 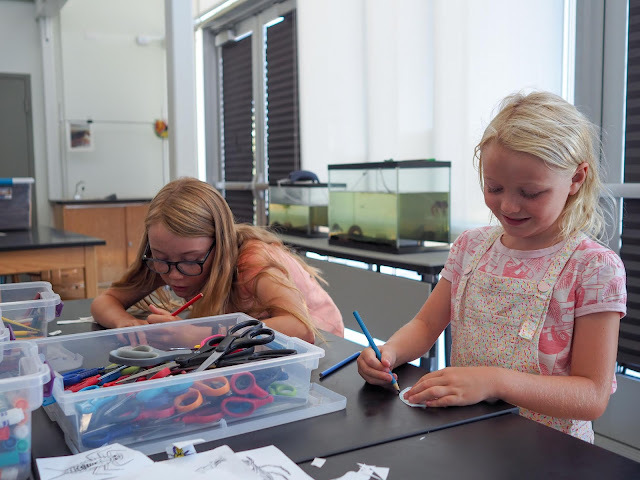 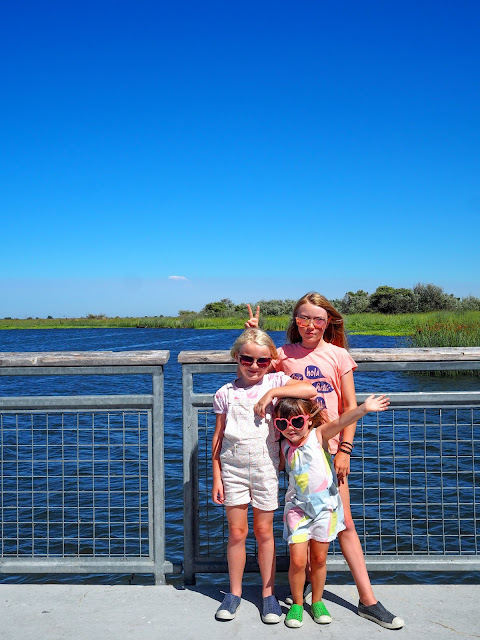 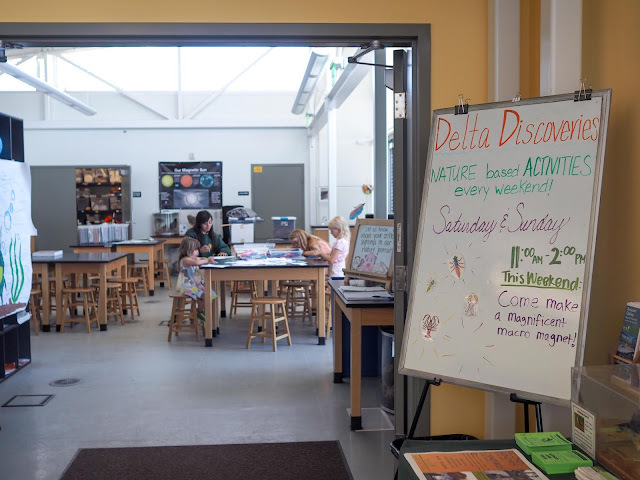 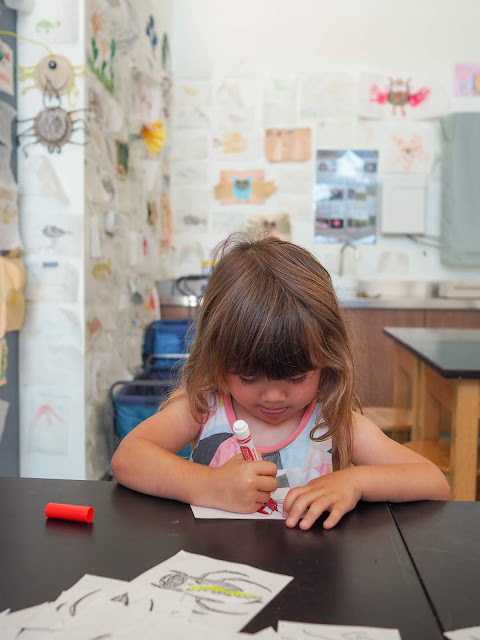 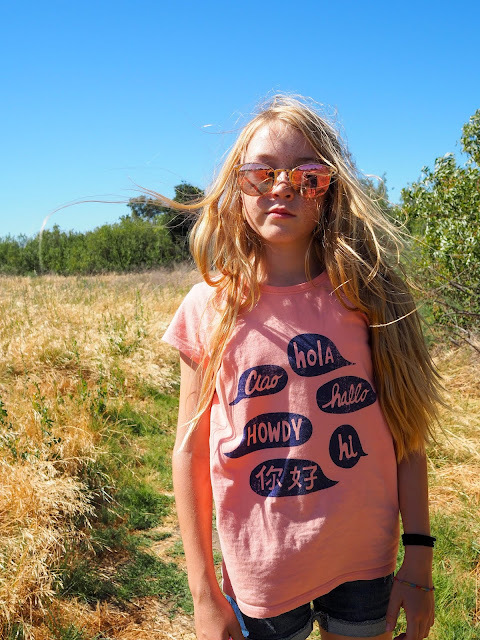 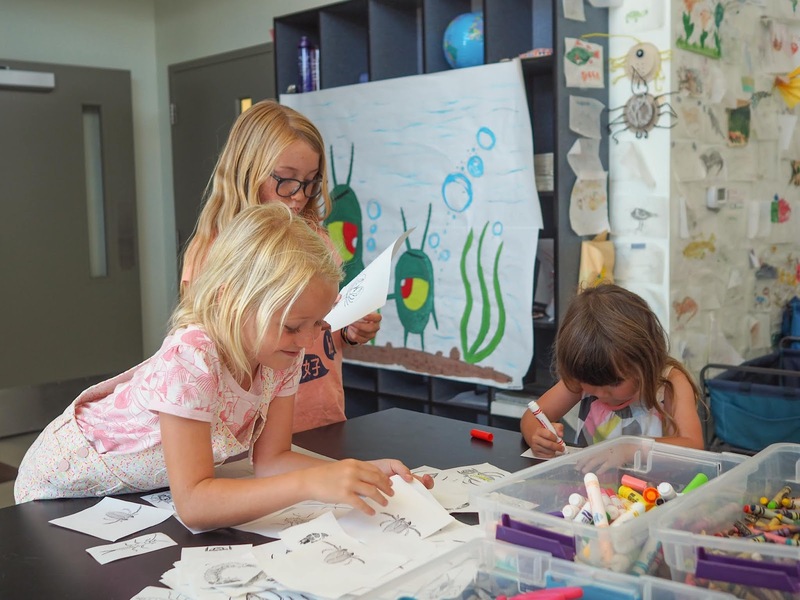 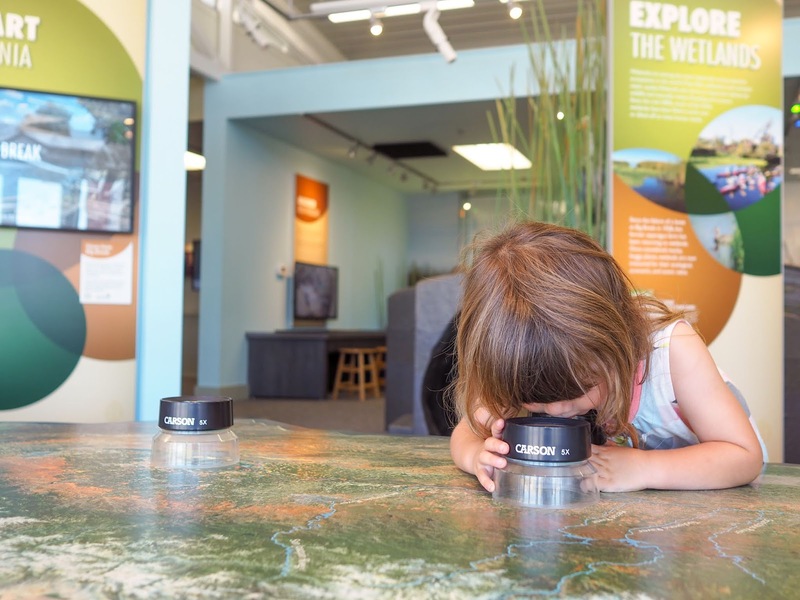 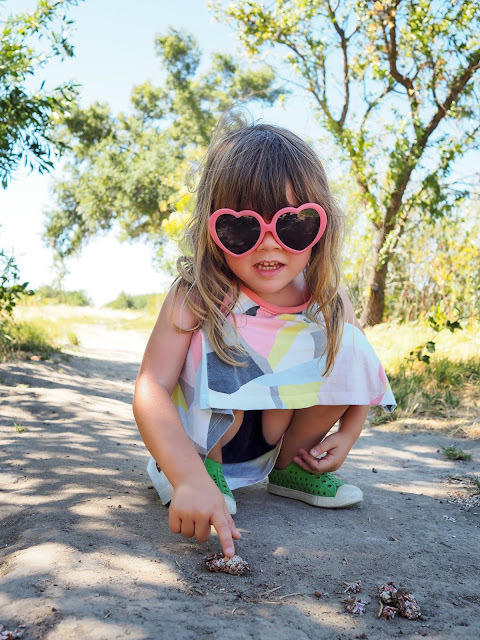 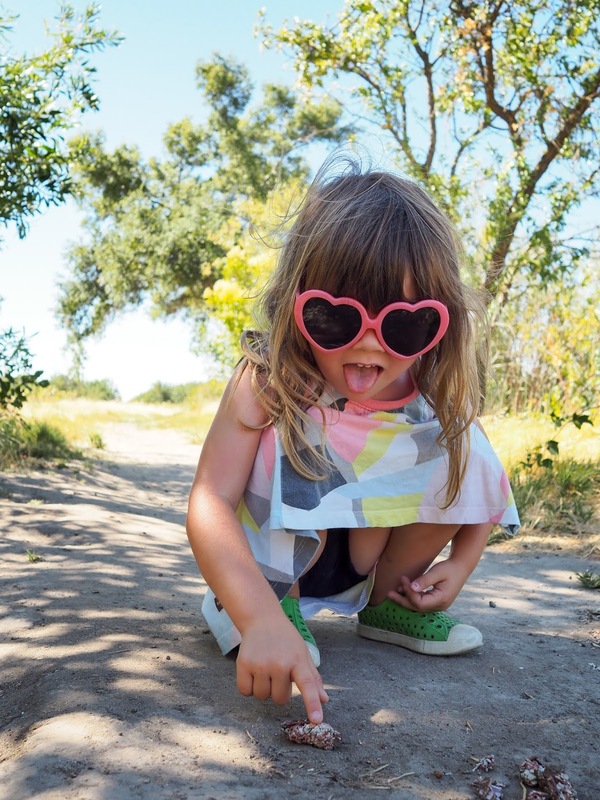 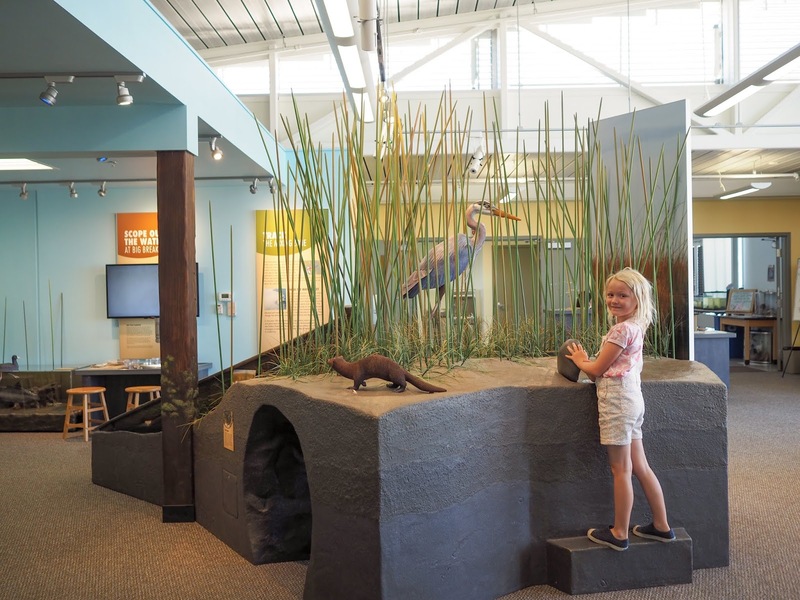 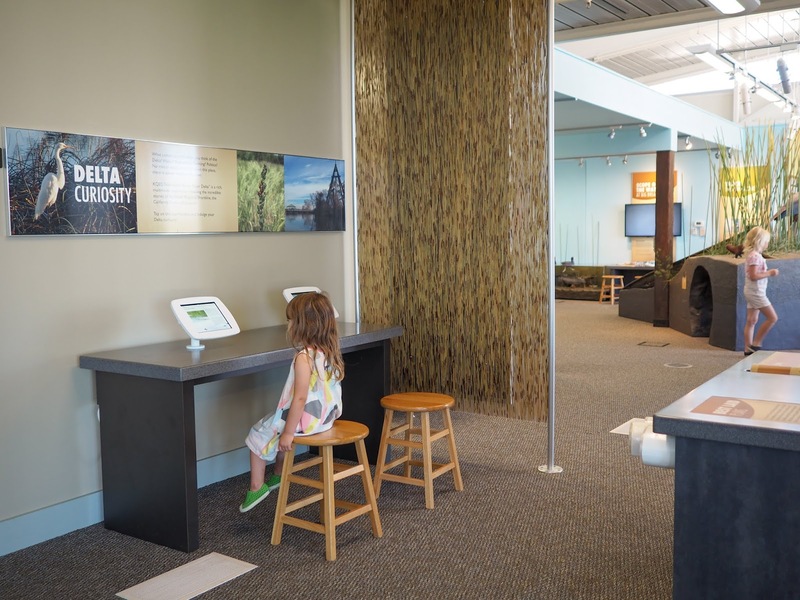 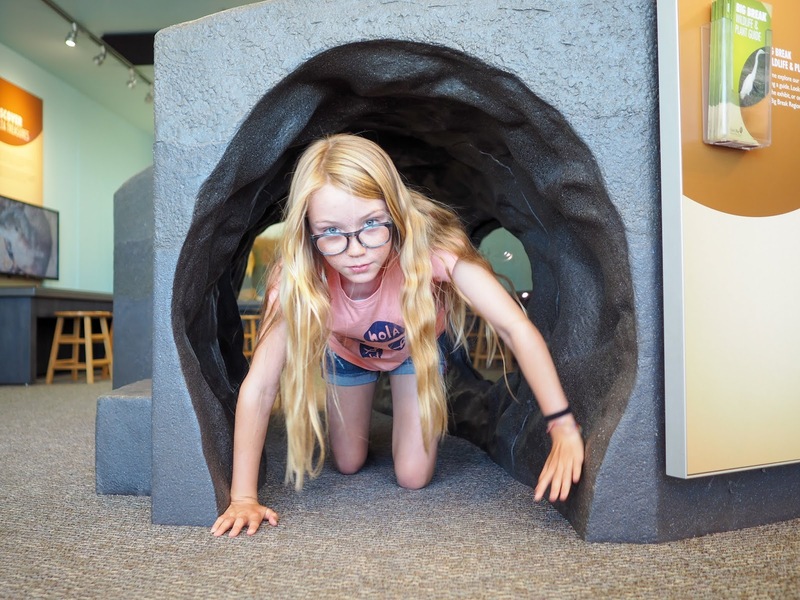 When we first arrived at the park we headed to the visitor center where we found plenty of fun hands on displays about the landscape, plants and animals, plus craft activities to keep the kids busy. 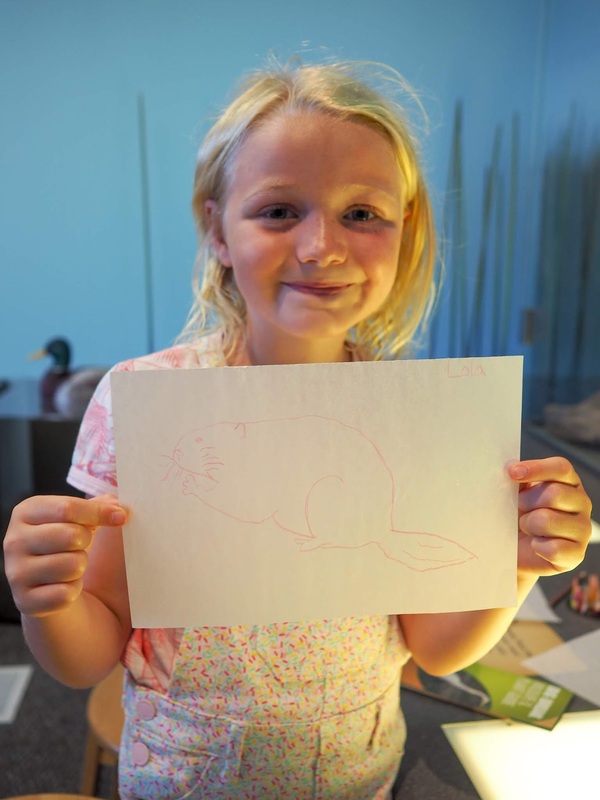 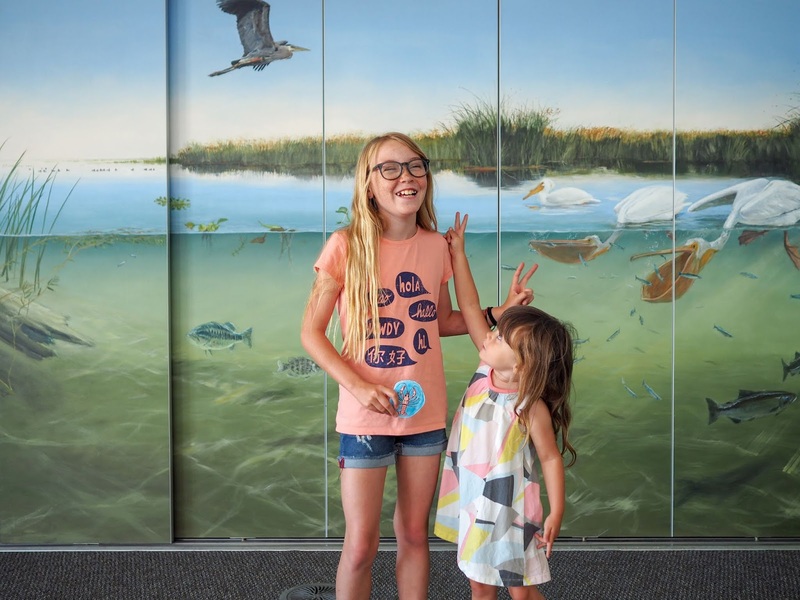 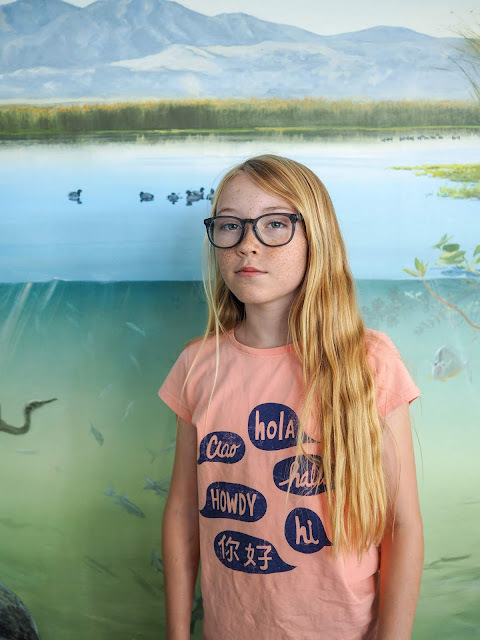 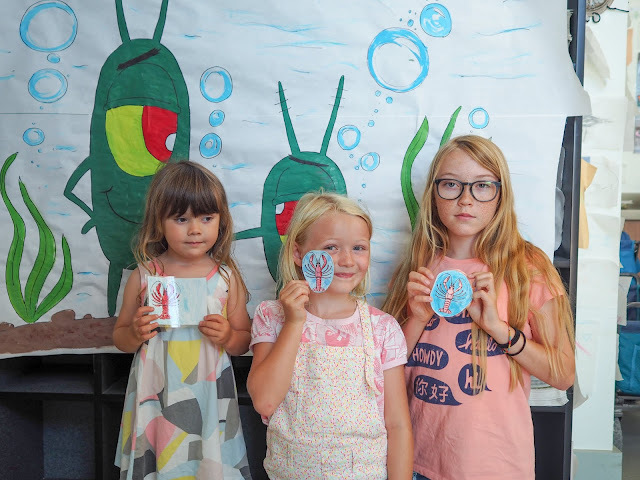 The girls traced pictures of local birds, looked at plankton through a microscope, learned about animal pelts and skeletons, made invertebrate magnets, checked out live fish in the aquarium and taxidermy birds on display, crawled through the interactive display, looked at maps, and posed for fun photos. 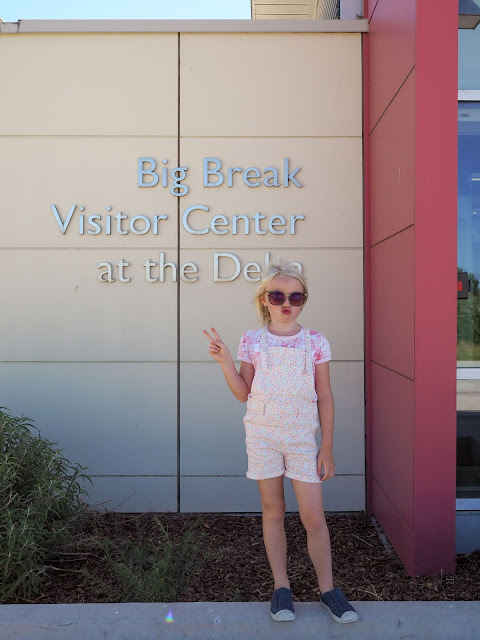 I have to say that I was really impressed with the visitor center. 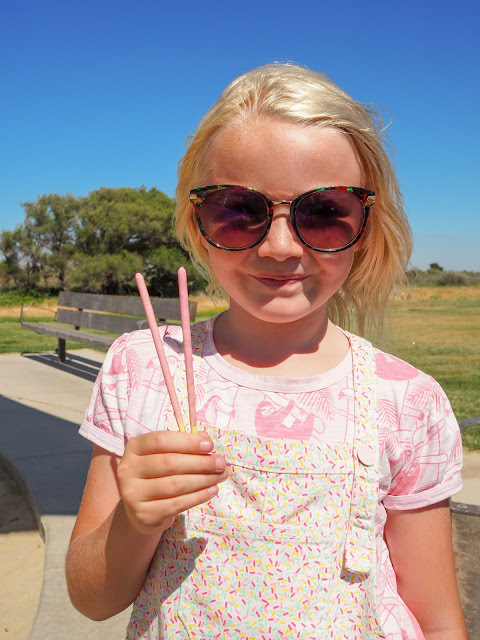 I definitely didn't expect to find as much there as we did! The facilities are modern and thoughtfully designed. After quite some time in the fantastic visitor center we made our way outside to go explore. 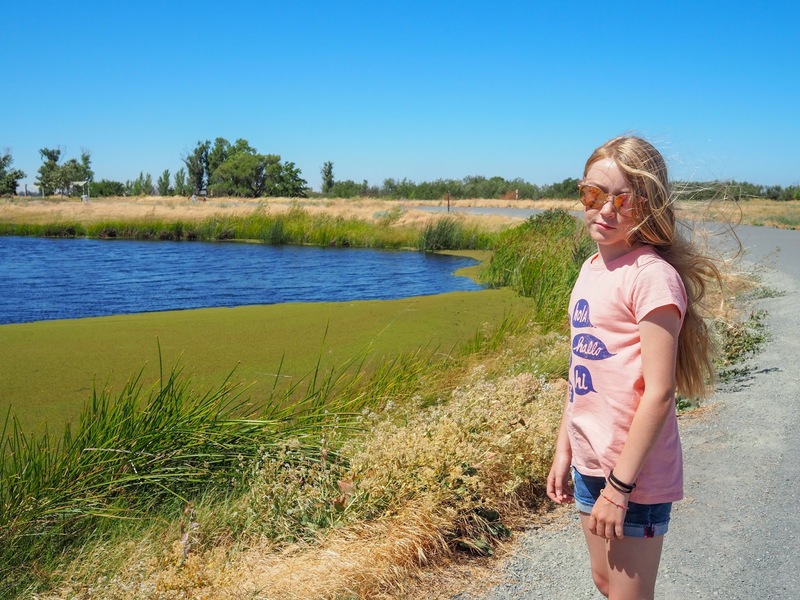 A short walk away from the visitor center we found ourselves by a marsh area where a variety of reeds and grasses lined the water. The girls were amazed by the bright green algae on top of the water and spent quite some time discussing whether or not they thought it would allow them to walk across the water - something they did not try, of course. 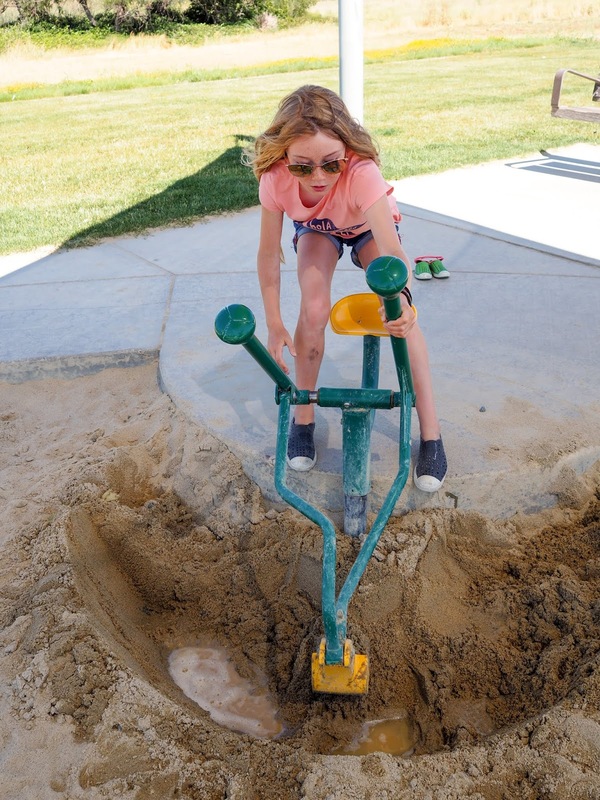 They concluded that while it looked solid, they'd be sure to sink through it. 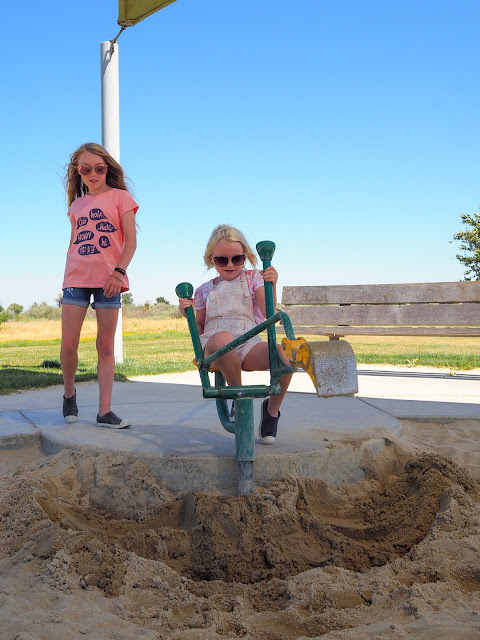 A short walk further and we found ourselves at the sand play area by the picnic grounds. 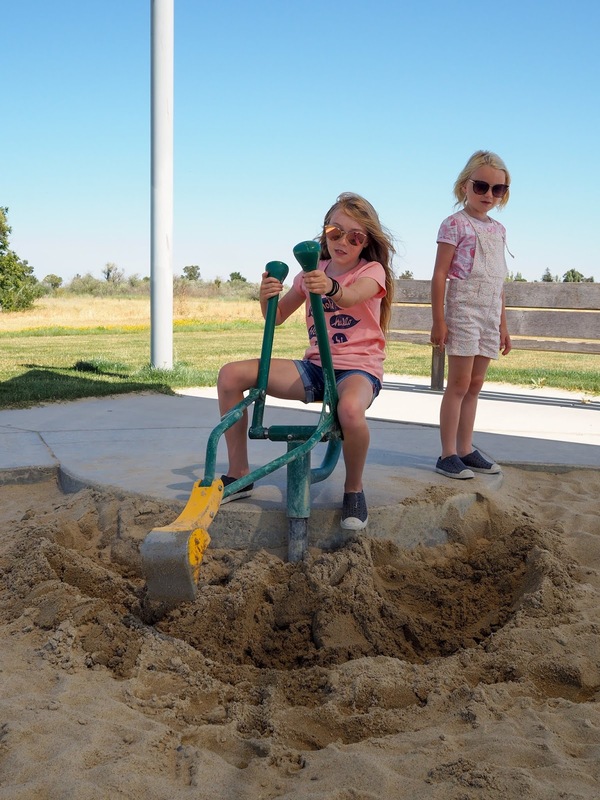 Ava and Lola had fun digging with the built in digger toy, but it was pretty hard work and Mathilde wasn't strong enough (or tall enough) to use it. Mathilde entertained herself using her hands to dig in the sand and climbing on the fish shaped bike rack nearby. 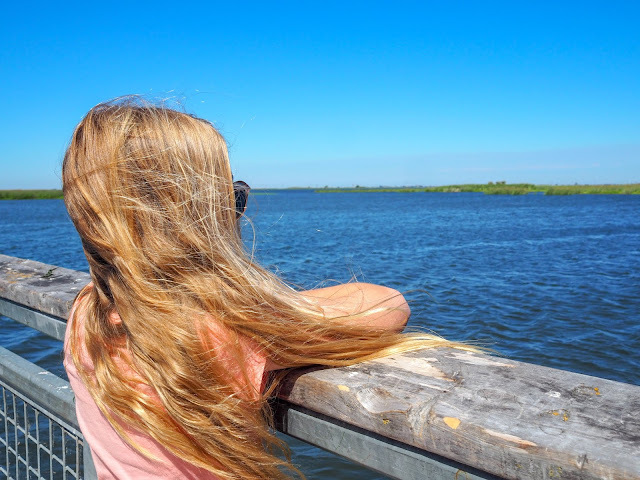 I figured it was about time we actually made it down to the water so we headed to the pier. 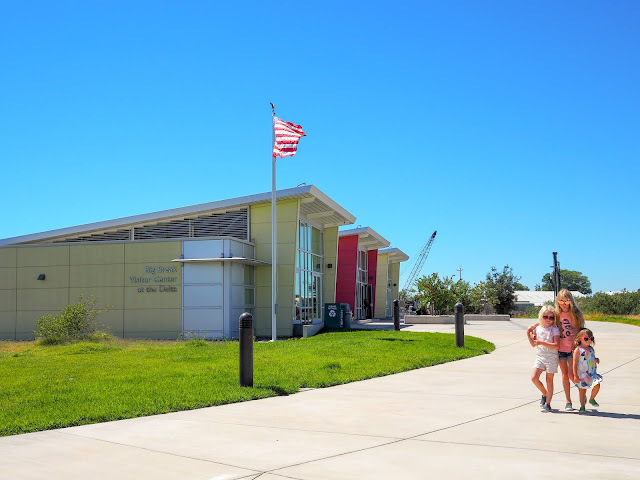 Now, I've realized in hindsight that I didn't take many photos of the pier itself to show you (there were sunbathers right in the middle and I didn't feel comfortable photographing them) so you'll just have to trust me that it's a nice modern structure. From the pier we had stunning views over the Delta. To the west we saw the old industrial ruins (a dredge and other maritime stuff). The the north and east we saw small islands surrounded by reeds, and a lot of aquatic plants floating on the water. 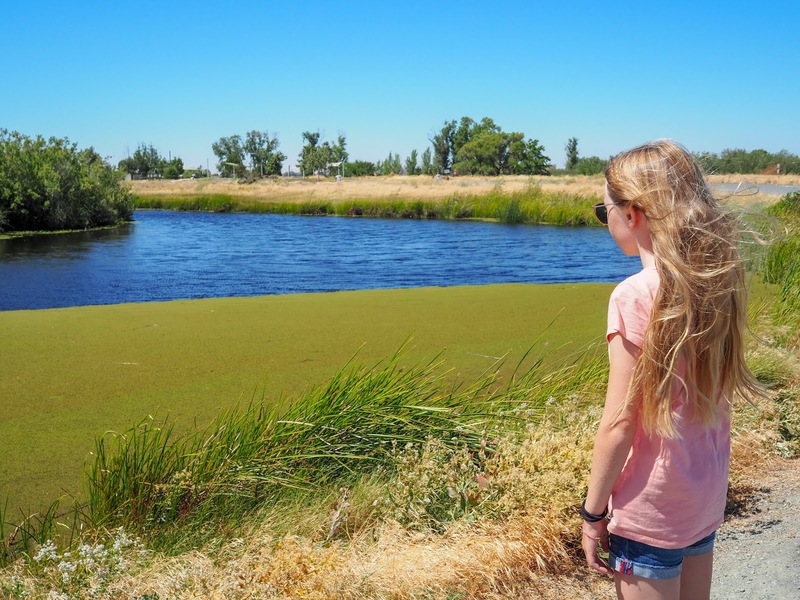 It reminded me a little of the water hyacinth we had seen in India years ago. 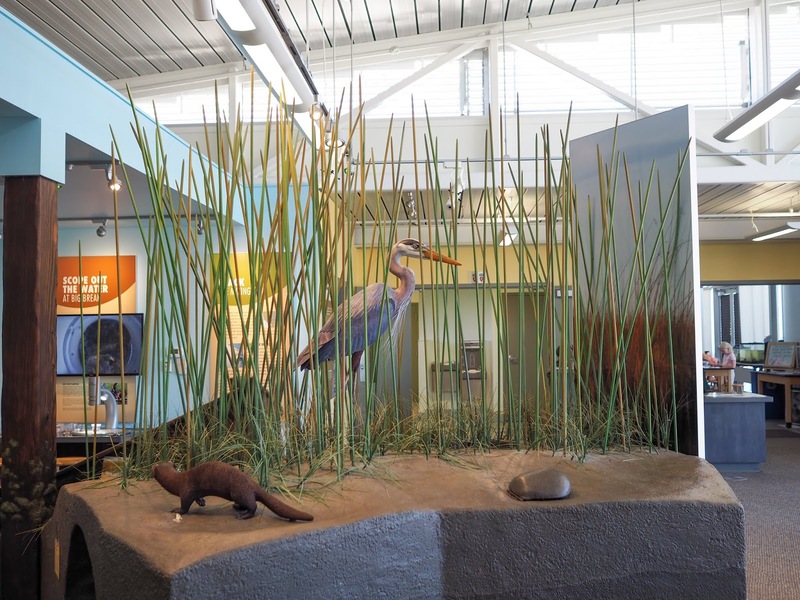 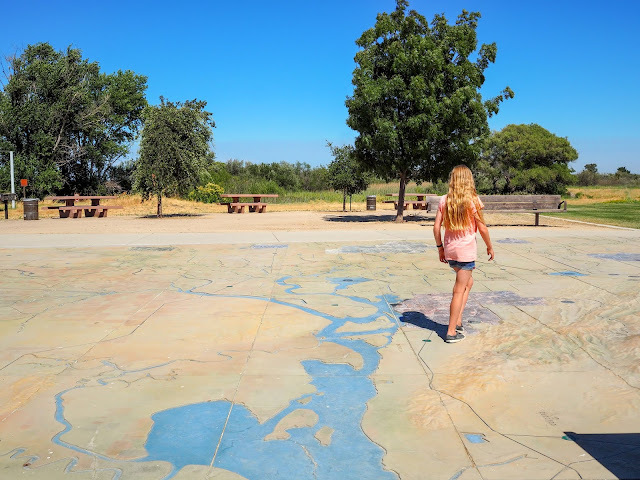 One fun element of the shoreline park is the Delta Discovery Experience, a 1,200 square foot interactive map of the region. 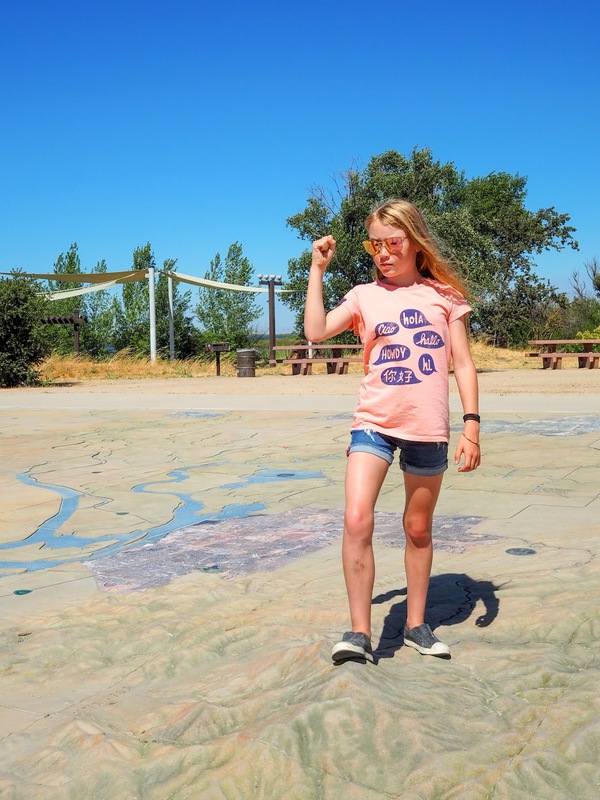 The girls enjoyed following the course of the rivers along the map and Ava even climbed Mount Diablo. Ha! 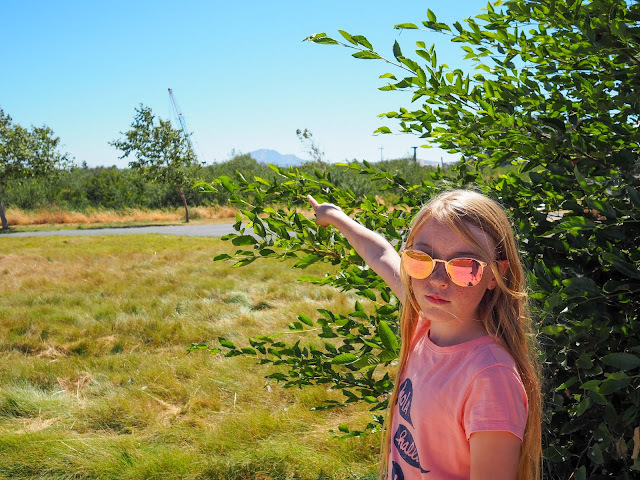 The real Mount Diablo could be seen nearby and it's just a little taller than the one of the map! 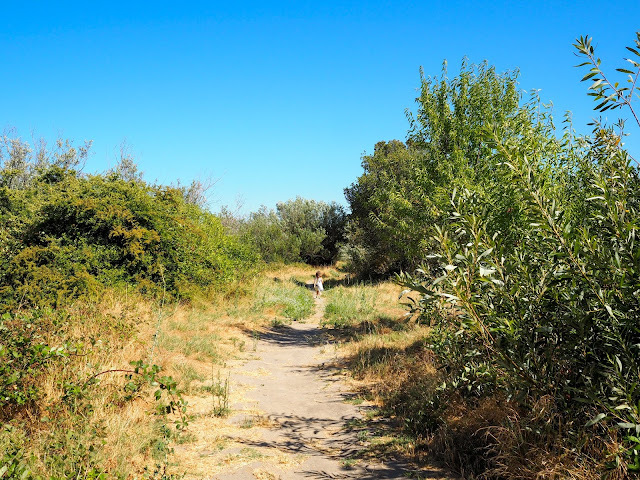 We stopped for a few snacks and then made our way to the short hike along the marshland. 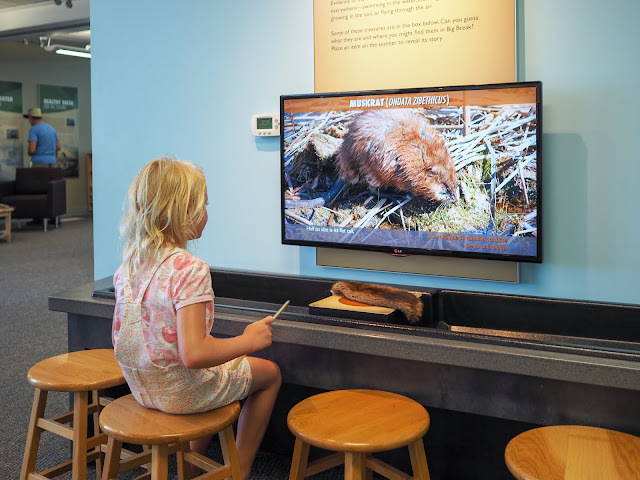 The guides at the visitor center had told us to keep an eye out for beaver dams, river otter dens and slides, and river otter poop along the trail. We didn't spot a beaver dam but we sure did find plenty of river otter poop alongside their slides! 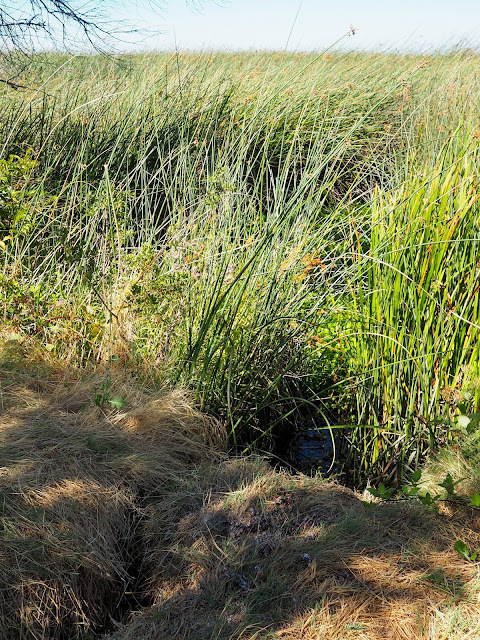 The otter slides are where the otters make their way into the water. I would've loved to have seen some otters using the slides, but we were not in luck. The guide at the visitor center had mentioned to the girls that they would be able to tell from the river otter poop what they had been eating. 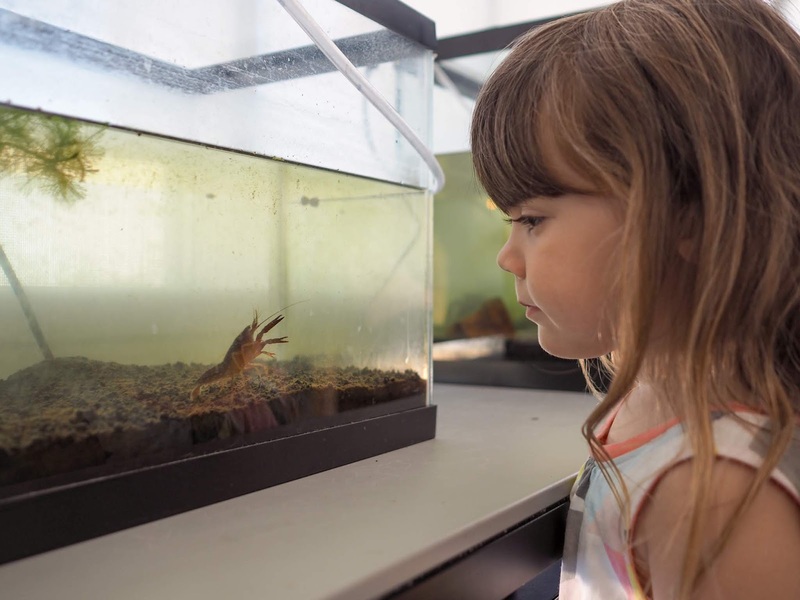 Mathilde made sure to inspect it very closely (a little too closely) and worked out that the river otters had been eating crawdads (or lobsters as she called them) just like the ones she had seen in the visitor center. We continued on with the short hike and while we didn't see any more otter slides, we could here animals of some sort moving in the grass and reeds, plus we could hear plenty of birds singing. It was quite lovely. The sign at the end of the trail (or the beginning had we been coming from the other direction) warns of rough terrain, but to be honest it really wasn't all that rough. You definitely wouldn't want to try and take a stroller along it, but it's very easy for small children to walk, especially given that it's only a few miles all up. 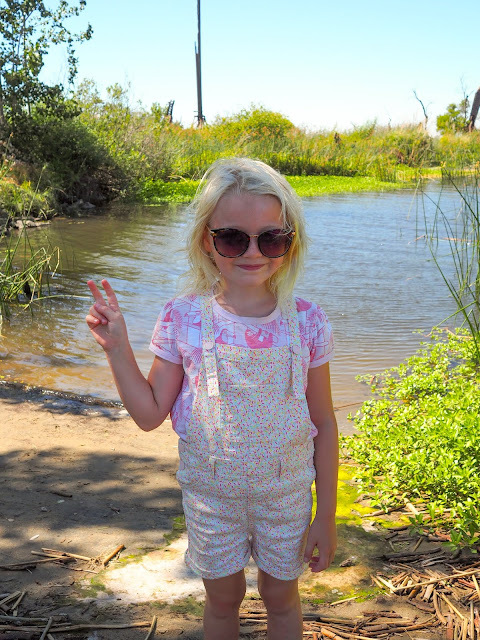 We had a lovely afternoon exploring the park at Big Break Regional Shoreline. 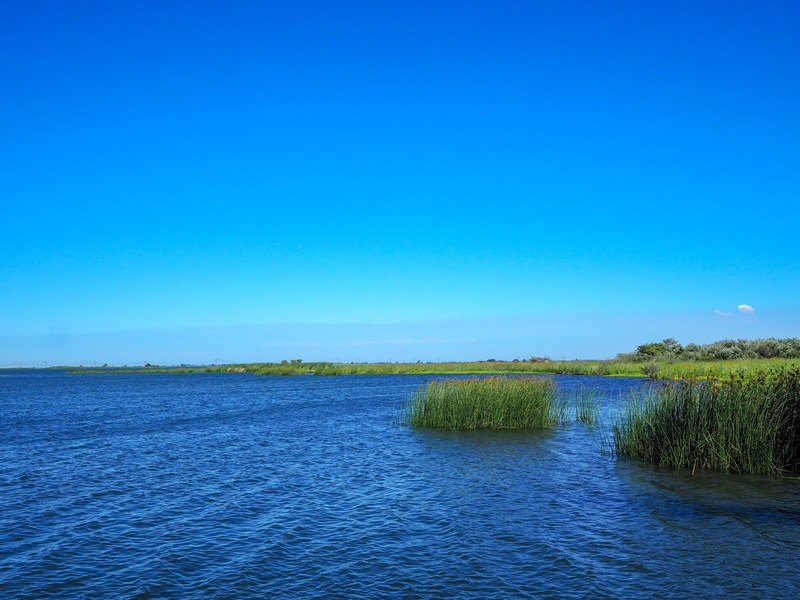 It would definitely be a great place to go kayaking, share a picnic with friends or go fishing. 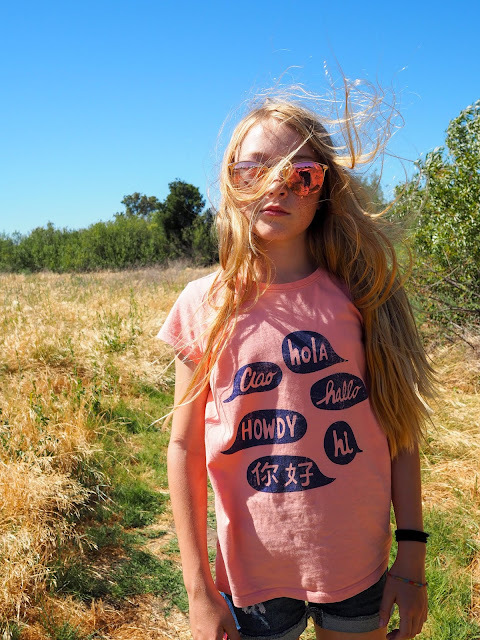 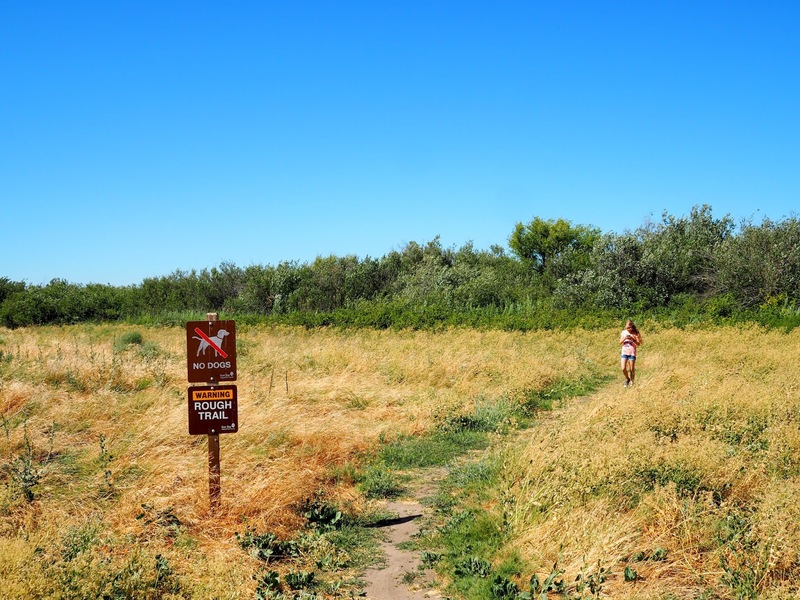 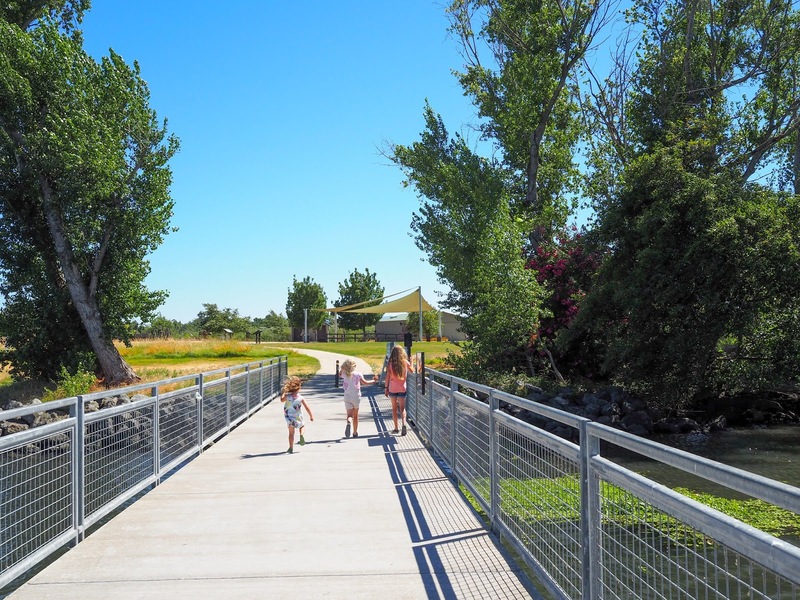 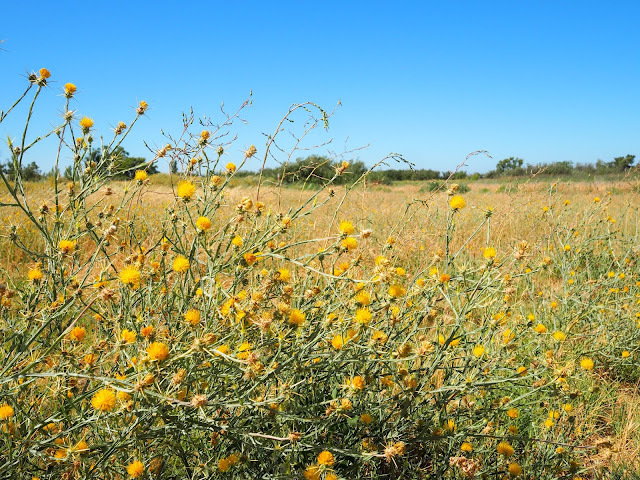 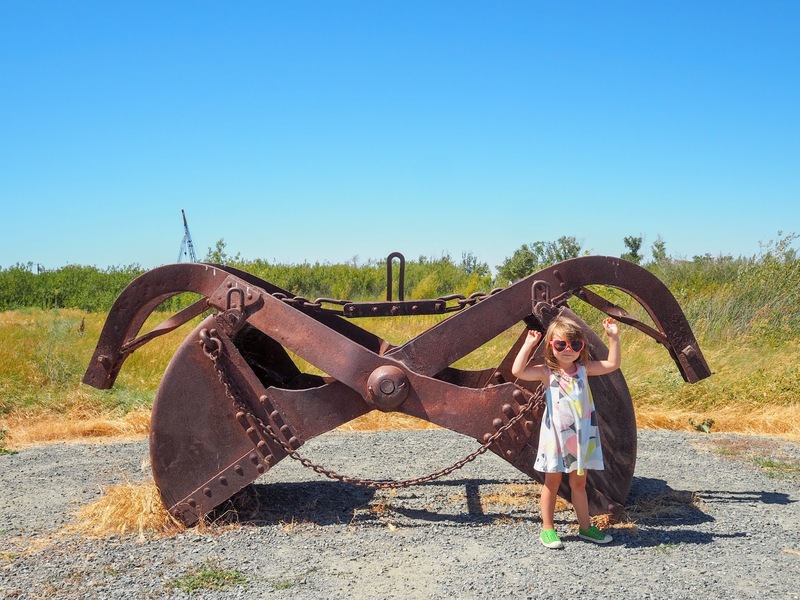 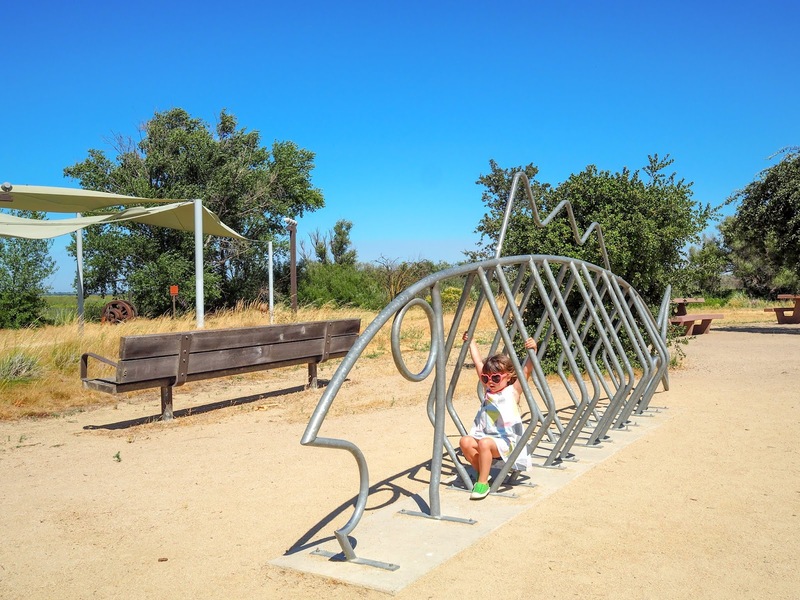 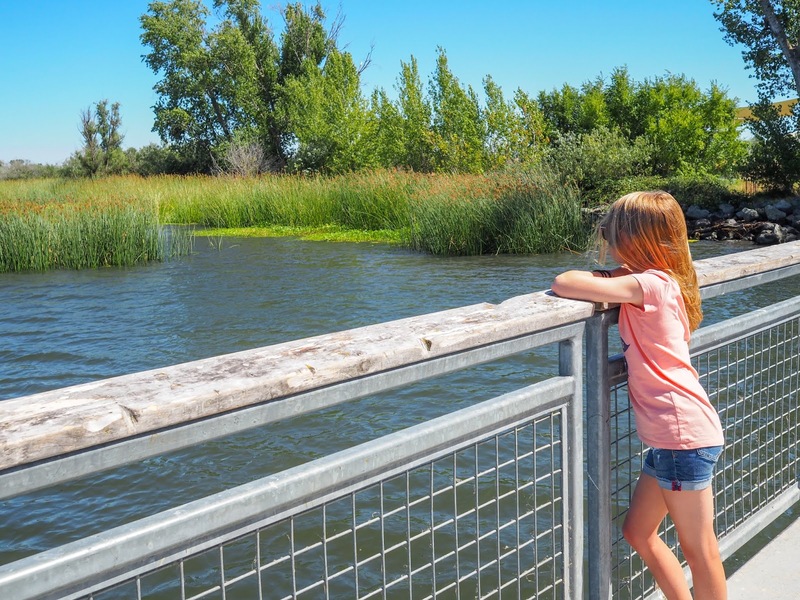 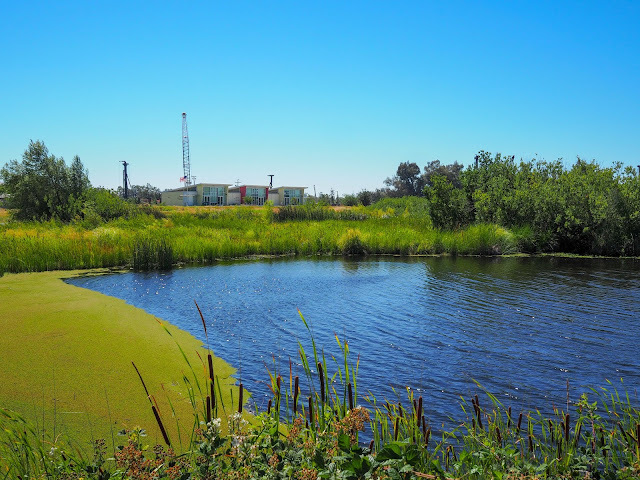 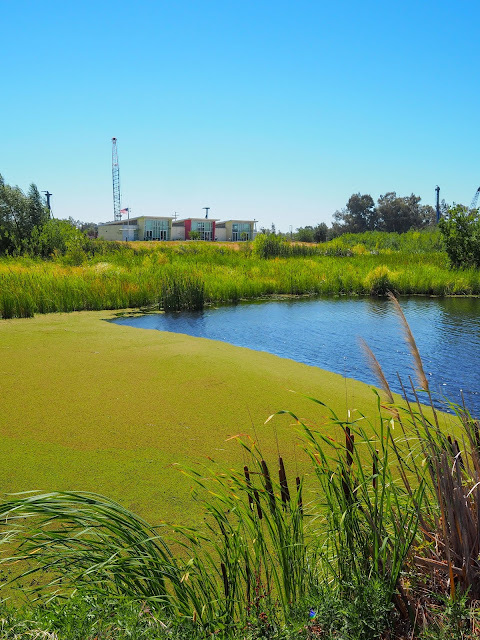 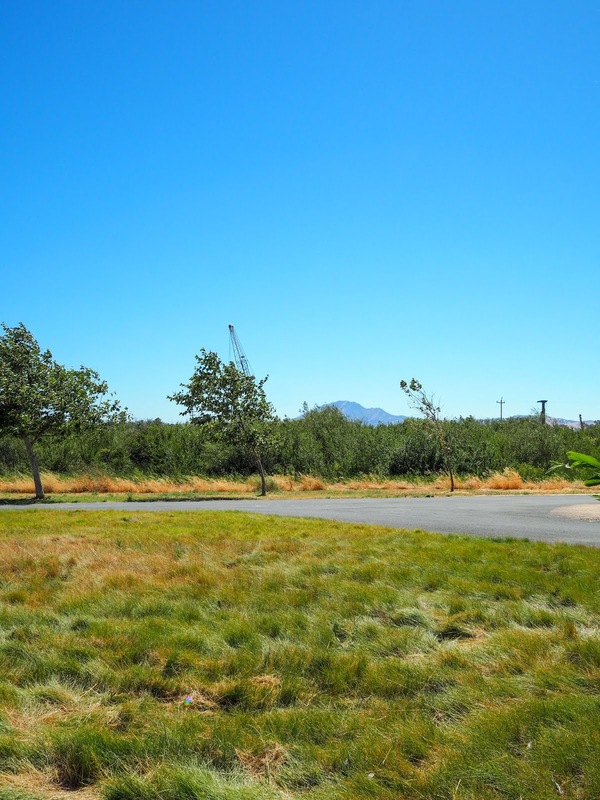 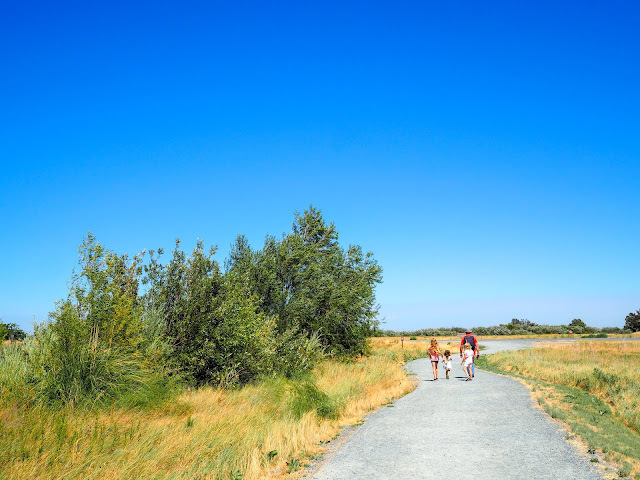 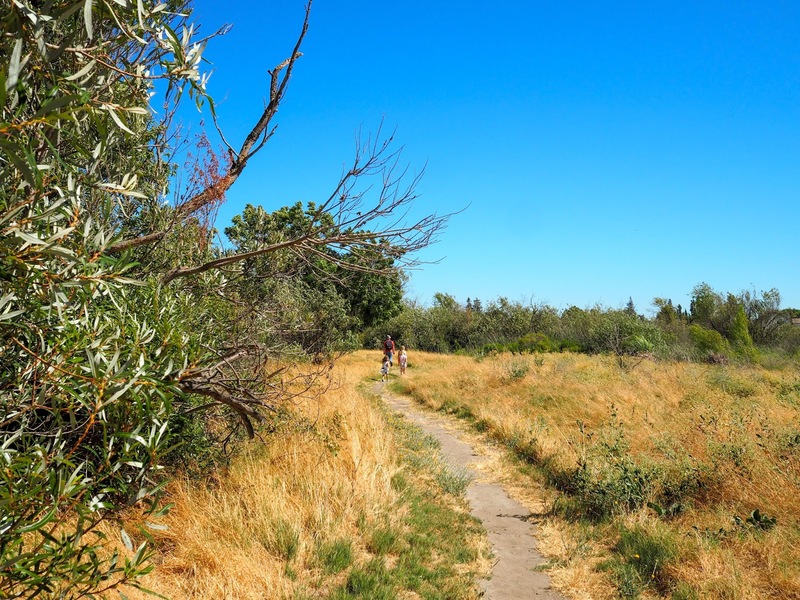 For longer hikes, the hiking trail connects to the Marsh Creek Regional Trail which in turn joins the Delta de Anza Regional Trail, which runs through Oakley and Brentwood.